OK folks, we’re excited to be giving away tickets to two of our favourite acts! 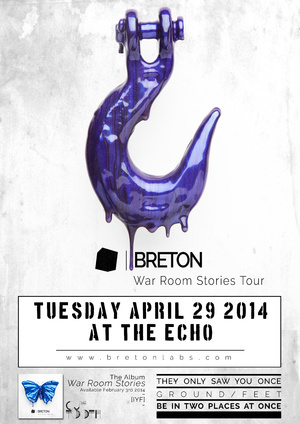 First up, we’re giving away 2 pairs of tickets to see UK’s Breton at The Echo in Echo Park/Los Angeles next Tuesday (April 29). It just so happens that Breton’s latest record War Room Stories is also one of our favourite records of 2014 so far (read our review of the single S Four). Entries close 12pm PST on Monday (April 28). Secondly, we’re giving away 2 pairs of tickets to see the brilliant UK electronic trio, Darkstar at The Echo in Echo Park/Los Angeles on Friday May 2. Darkstar’s latest album News From Nowhere – their first for Warp Records – is a beautiful, uniquely melodic, and inspired body of work. Entries close 12pm PST on Wednesday (April 30).